PICP perform very well in cold weather conditions. Studies have found that freezing temperatures do not result in surface heaving and temperatures in the base and subbase remain above freezing even when surface air temperatures are well below freezing. Studies conducted at the University of New Hampshire have shown that “pervious pavements exhibit greater frictional resistance, and can become clear of snow and ice faster, than conventional pavements. Substantial reductions of up to 77% in annual salt loads for anti-icing/de-icing practices were demonstrated”. The reduction in salt usage was primarily due to the ability of melt water to drain through the porous surface because of the insulating qualities of the PICP system; surficial re-freezing as black ice is therefore eliminated and the associated salt usage prevented. Rather than use deicing salts or sand, an alternative is to use the same ASTM #8 or #9 chip as used in the paver joints. The Solar Reflective Index (SRI) is a composite measure or indication of how well a surface emits absorbed heat. Since solar heat represents approximately 47% of the sun's energy at the earth's surface, it is an important consideration when selecting paver colors. Belgard has tested a number of their lighter color reflective pavers to verify they achieve the desired SRI rating in accordance with the most recent LEED requirements as the SRI results are subject to the specific mix designs of each manufacturer, contact the local sales representative for results. 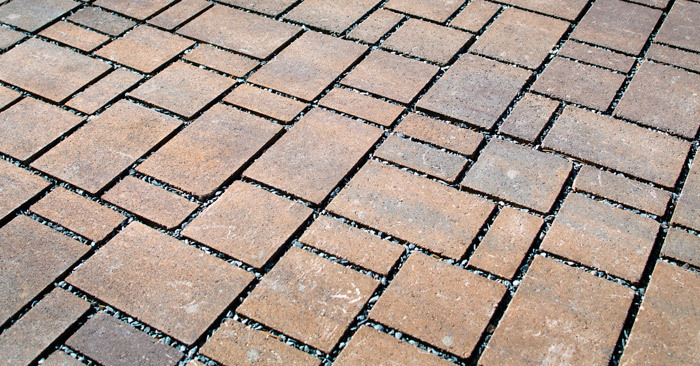 In an effort to address the remaining 53% (ultraviolet 3% and infrared radiation 50%), Belgard researchers are exploring the environmental benefits of permeable pavers and photocatalytic cement. Innovative advances in this technology are expected soon. 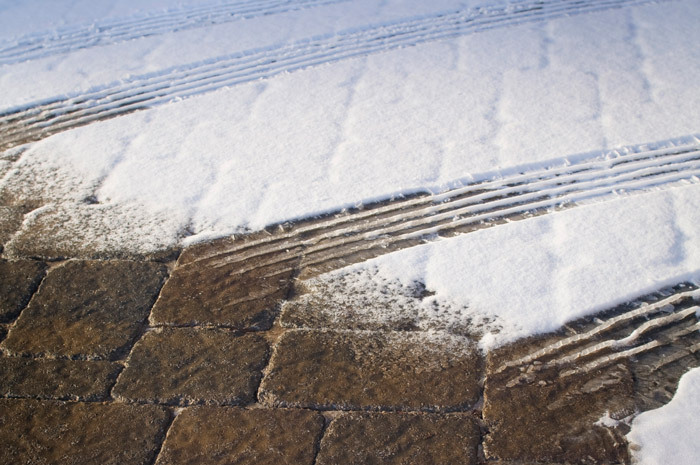 Because permeable pavers are made with high quality concrete, snow can be plowed or shoveled without the need for special blades or equipment. Source: Roseen, et al "Final Report on a Cold Climate Peremable Interlocking Concrete Pavement Test Facility at the University of New Hampshire Stormwater Center", May 2013). The "heat island" effect impacts urban areas that have systematically used up existing natural ground cover by replacing them with buildings, parking lots and paved streets. The resulting lack of parkland and trees results in higher overall temperatures in these microclimates. In turn, these temperatures place a higher demand on energy, produce more pollution and greenhouse gas emissions, and clearly create quality of life issues for all those living in such environments. To mitigate the negative impacts of the “heat island” effect in urban environments Belgard Commercial continues to research the environmental benefits of permeable pavers and solar reflective index concrete. Although using lighter colored reflective paver blocks does benefit Urban Heat Island, the increased pavement reflectance adversely affects human thermal comfort during hot periods due to an increase in the Mean Radiant Temperature contributed by the increased reflected radiation striking the human bodies. Using the PICP system as an evaporative system is a way of mitigating this impact. Water that is stored in the base is allowed to slowly evaporate through the pavers thereby cooling the paver surface. It is no different than how our bodies cool off by perspirin. Studies at University of California-Davis found that keeping water near the surface of the pavement, through sprinkling water on the surface or injecting water into the pavement to keep the water level near the surface, will increase the evaporation rate and consequently produces a better evaporative cooling effect. The ability of air and water to be able to move through the PICP to new or existing vegetation is key to their survival and growth. 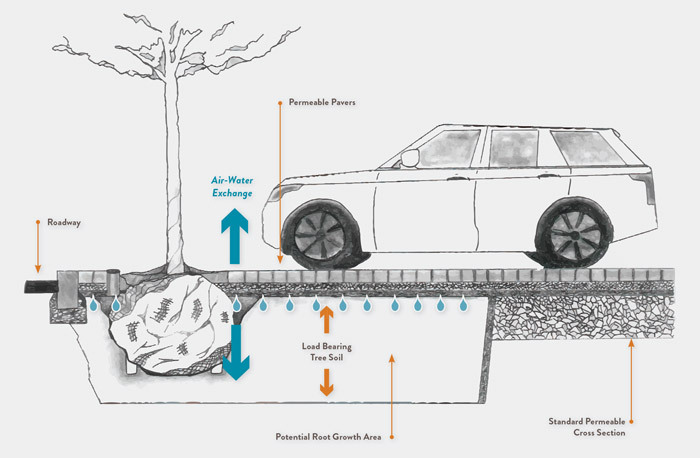 By adding load bearing tree soils which support the weight of pavement and vehicles but still provides space for tree roots to flourish, the pavement can extend right up to the border of the tree pit. This practice is not possible with conventional paving without the use of specialized structural supports (steel grates, concrete vaults).